Max is a teacher, an internationally published poet and writer, and the founder of Hollowdeck Press, LLC. He has taught poetry, prose and creative writing to various groups for the past 20 years. 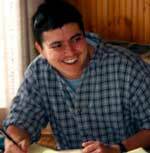 Max has worked as a journalist for publications around the country, and has taught and lectured at the University of Colorado, Colorado State University, Rose Medical Center and Naropa University. Contact Max at maxregan@mac.com and www.hollowdeckpress.com.